the cultural, and her identity as a Black Latina woman. Naila Saphia, often creating art under the moniker Mellow Domingo, is a multi-medium artist who focuses on creating art surrounding her identity as a Black Latina woman. Through words, photo, and video, Naila creates colorful depictions of her culture, carving a space for herself in the zine, performance, and film field. When I met with Naila, she arrived from a photoshoot with her eye makeup sparkly and eccentric. Shy at first, she lit up with enthusiasm as she began talking about her work and its relation to race and her culture. As a teenager, she studied acting at a rigorous, historically black, art high school. Her work ranges from spontaneous and unplanned, to strategically thought-out documentary pieces about culture and identity. She is additionally part of La Liga Zine, a zine and community that focuses on Latinx culture and the themes of immigration, community, and belonging. The Le Sigh was lucky to have gotten an inside peak at Naila's work and the La Liga Community. The Le Sigh: How did you become interested in art as a young child? Naila: I’ve always been very involved in art of all types since I come from a family of artists. I grew up seeing my mother’s paintings, hearing these amazing stories about how my grandfather used to paint all over the house, dressing up in her Salsa outfits and trying to fit my little hands in her castanets. My mom made it her job to get me in every art form imaginable: from the dance lessons I took for 9 years, to piano lessons, to glass-making classes. She took me to every museum in DC and bought me craft-making kits and a giant book of abstract art, which is where I think I got this idea of art being limitless. TLS: What types of themes do you find your work encompassing? Naila: Mostly Identity, Who I am, Who I am becoming, Where I am spiritually and mentally and how that relates to others. I will forever be in the process of becoming, endlessly creating myself, and so is everyone else, and I feel like why not share our experiences with each other? TLS: Your documentary “Black Latinas Exist!” is about the need to create a space and identity for Black women and Latina women. How have your experiences as a Black Latina woman shaped the documentary? What else does the documentary focus on? Naila: A lot of moments inspired “Black Latinas Exist!”, but the breaking point was when I was in high school during my senior year. My school hired a broadway director for our senior showcase and I was so excited! However, I found myself being denied of roles and it was extremely frustrating because it made me think: you know this is my senior year, I have literally been here studying for four years, what am I doing wrong?, what do I need to be improving on? what is keeping me from being casted in my senior showcase? Until that year, I had been cast many times, so it couldn’t be that I was simply untalented. When I would ask my teachers, they would often beat around the bush. TLS: What is La Liga Zine and how did you get involved? What are your main roles with the zine? How has the community/space played a role in your life and art? indígenx, chicanxs, latin americans who are are examining and dissecting their cultural identities through different types of self expression. I sent them the trailer of my documentary, and they asked if they could interview me for their site. They premiered the interview and my documentary and asked me to be a part of their community. Now, I am a regular contributor and kind of bounce ideas and come up with articles to post on the site every now and then, in addition to helping table at events. Honestly, I’ve met the most amazing people and created lifelong mentors and friends like Mari, Ana, Ale, Jamie and Fefi who are giving me the space to grow and learn. They have inspired me beyond measure and given me so much advice. 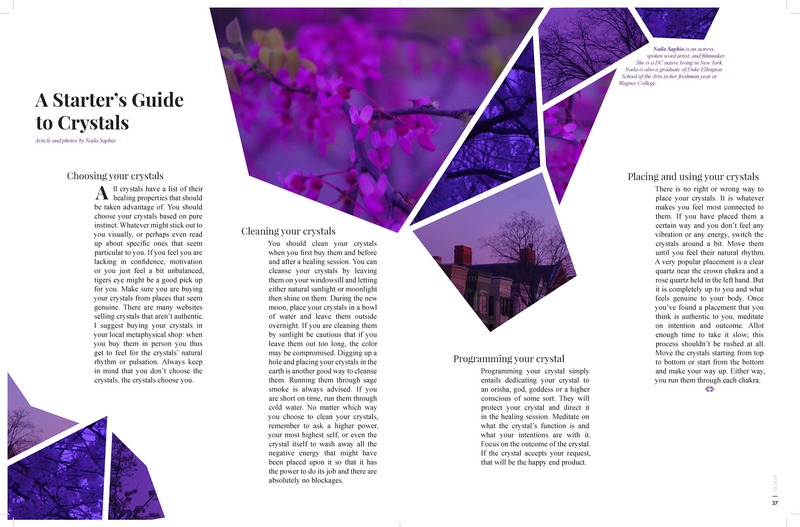 TLS: In your spread for La Liga, “A Starter’s Guide to Crystals,” you talk about cleaning and programming crystals. How has spirituality and/or religion played a part in your work? Naila: I would categorize my experience as more of a spiritual one than a religious one. I draw a lot of my ideas from the Orishas, especially Eleguá, Orunmila, and of course Yemaya, particularly in a short play I wrote last year called W O M Y N. It is about the creation of womyn and the relations between Gods, Me, Her, She, and I. The play involves going back to the initial roots of who we are within nature and how spirituality isn’t a science experiment, but instead an individual journey. It must be felt--not tested with beakers and goggles. The play is performed through script and Mary Overlie’s Viewpoints, which is a tool used to create space using elements like topography, kinesthetic response, and spatial relationship. Overall my spirituality gives me the headspace to create, to think, over think and rethink. A Starter's Guide to Crystals, La Liga Zine, "Copia de la Yerbera" issue. TLS: Can you talk about your short film “Smaller Orbits”? What is the concept behind it? Naila: “Smaller Orbits” was a pretty spontaneous piece, in fact I can’t even take credit for it completely. It is rightfully a piece by my 8-year old little cousin with a few shots by me and edited by me. On a trip that I took to Philly for a modeling gig, my cousin was acting really antsy and wouldn’t sit down, as most kids act when they are left without something to do for a while. I found that when I gave her my camera, she would quiet down and chill out. So I let her do her thing and shoot whatever she was shooting. She would say the entire time we were on the trip “I’m making a movie” and “I’m a movie star!” So I edited it and made my little one her own movie so she could be a movie star. smaller orbits from mellowdomingo on Vimeo. TLS: Can you tell the story behind Mellow Domingo? Naila: MellowDomingo is honestly not even anything special, Haha. It really just came out of my pure laziness of not wanting to work on sundays and not wanting to cover shifts on sundays. THEY: And I wondered when everything was over when would I get lost in the moon? I: And I wondered when I aged again and looked back on this time would I look back as if I was a child? TLS: Who are some of your favorite Black Latinx artists? Naila: As far as music, I would definitely say @Ibeyi, @DjBembona, @PrincessNokia, @Malucamala, and @ChulitaVinylClub. Visual art wise, I really love Karla Camacho, also known as @art_dekarla. And I love to watch spoken word by Ariana Brown @arianathepoet. More of Naila's work can be found at La Liga, and you can also follow her @mellowdomingo. Main photo by Sinjun Strom.